HELENA, Mont. (AP) — Leaders of a Hutterite colony are demanding an apology from the National Geographic Society and a pledge that it never again broadcast a television show they say misrepresented their way of life and damaged their reputation. National Geographic Channel CEO David Lyle said Wednesday an apology is unwarranted because the show gave a fair and accurate depiction of colony life. Caught in the middle are the stars of the show who say they have been told by elders to "tell the truth" but some of whom now fear possible excommunication. "That's what I'm scared of," said Bertha Hofer about the possibility of being cut off from the King Ranch colony. King Ranch colony minister John Hofer, Bertha's brother in law, wrote a July 31 letter to National Geographic Society chairman and CEO John Fahey that "American Colony: Meet The Hutterites" was supposed to be a National Geographic Channel documentary about the German-speaking agricultural community of Protestants in central Montana. Instead, Hofer said, the producers turned it into a reality TV show that encouraged discord within the community by pitting generations against each other. Situations and story lines were invented and the people were told what to do and say while the camera was on, he said. The result was an inaccurate depiction that has damaged the reputation of Hutterites everywhere, he said. "We feel we were ambushed and publicly humiliated by the producers of Meet the Hutterites, and by the National Geographic Society," Hofer wrote in his letter to Fahey. "King Ranch Colony did not sign up for this sort of abuse." 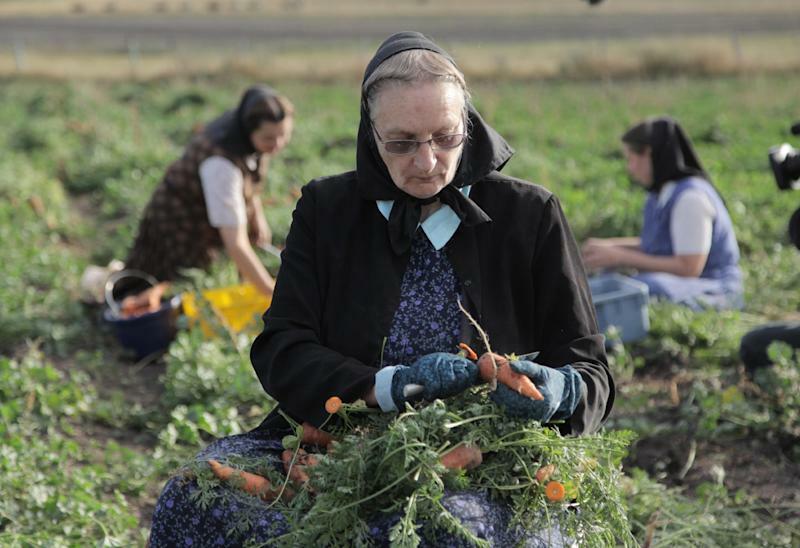 Hutterites are Protestants of German descent whose traditional, religious-centered lives have been compared to that of the Amish and Mennonites, but they live in commune-like colonies in rural areas of the western U.S. and Canada. They also make use of some technology, especially when it comes to agricultural production. But the extent to which the Hutterites let in the modern world and the effect of that on their cultural and traditional values is one of the themes in the 10-part series about the King Ranch colony 10 miles west of Lewistown that aired earlier this year. Producer Jeff Collins said he believes the negative response to the series originated with Hutterite elders in Canada. Those elders, he said, are unhappy that the Hutterites on the show chose to use the camera to talk about education, the role of women and the struggles of adapting to modern ways. Most on the King Ranch colony are pleased with and proud of the show, Collins said, but he believes they are now under external pressure to lodge a protest. "I knew this show would provoke controversy but I never knew the length the elders would go to regain some of the control they feel they lost," Collins said. In June, the bishops for the three sects of about 50,000 Hutterites in 500 colonies in North America said in a joint statement that they were "deeply disappointed" in the show and that it presented a "distorted" and contrived image of their faith. Lyle said he stands by the producer and that the show went through National Geographic's fact-checking protocol. "We believe in the show. We believe it's a fair and accurate portrayal of the life in the part time that we were there," Lyle said. John Hofer told The Associated Press on Wednesday that Collins arrived at the colony, found their life too boring for TV, and persuaded them to do things they never would normally do. "The way I feel, he mocked us and degraded us," Hofer said. "The first time I met that guy, you know what he said? 'I'm not out to hurt any of the people.' And he turned around and that's what he did. Our simple way of life was not exciting enough to him. " The King Ranch colony was paid $100,000 to participate in the production, and that money has been spent, he said. Bertha Hofer, a mother of three children who was featured prominently in the series, said the first three episodes were accurate depictions but then producers began presenting them with story lines. She said they rejected some ideas but went along with others. "It was just like they corrupted your mind. We just fell for it," she said. Hofer said the elders from Canada told them they wanted the colony members to tell the truth. But Hofer said she also feared that she would be punished after the show followed her and her daughter Claudia looking at a college in Great Falls. "We're just waiting to see what will happen, it's just day to day," she said. Colony spokeswoman Mary-Ann Kirkby said the levels of Hutterite education differ by colony and by sect. In general, she said, the elders are not against education but are concerned that young Hutterites who leave for public school may never return to the colony. Claudia Hofer wrote in a statement released by the Hutterite colony through a spokeswoman that most of the scenes she was in were staged and scripted. "None of them sounded bad in any way but I was totally shocked when I saw the edited version of the episodes," she wrote. Another colony member, Wesley Hofer, said in another statement released by the colony that an episode in which he was rushed to a hospital for what was believed to be a heart attack was staged. Collins denied creating story lines, saying that life on the colony is so foreign to a newcomer that there is no way to make up stories for them, and they wouldn't have gone along with it, anyway. Collins also said he believes the statements from colony members disavowing the show were coerced by elders who have threatened members with excommunication if they don't write them. John Hofer said the statements were written voluntarily. Bertha Hofer said she was not coerced to write a statement, though she said she would not speak of others' statements, including her daughter's. National Geographic Channel is a unit of News Corp.